THE PORTER'S HAPPY EYES, KOLKATA, 2013. Happiness reflects from the soul. It is not a a result of the money you have. Its the result of how you feel and embrace life. Photo taken at Malik Ghat, next to the river Hoogly, is one of the biggest flower markets in Kolkata. Its a place full of colour and scent. People, like this porter, work through the day and make about $2-3 a day. Still you can see the happiness shine through their eyes. 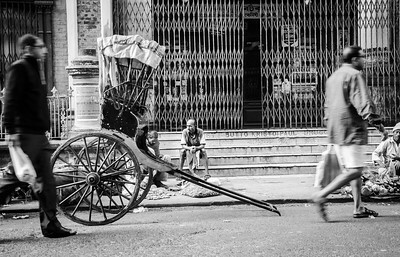 Kolkata (India), is probably one of the last places in the world where these human powered rickshaws still exist. Around 1880, these rickshaws first appeared in India, in Simla. 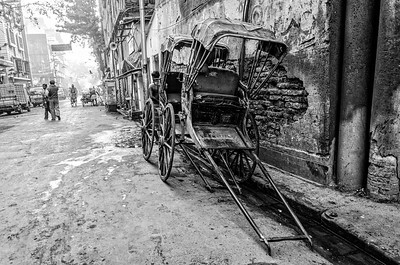 At the turn of the century these were introduced in Kolkata. In this photo, the rickshaw runner takes a break and waits for the next ride. OPEN AIR SALON, KOLKATA, INDIA, 2013. 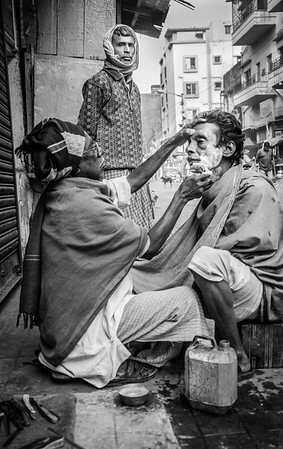 A barber on the streets of Kolkata, India, gives a shave to a customer and another one waits. WAITING FOR THE SALE, KOLKATA, 2013. 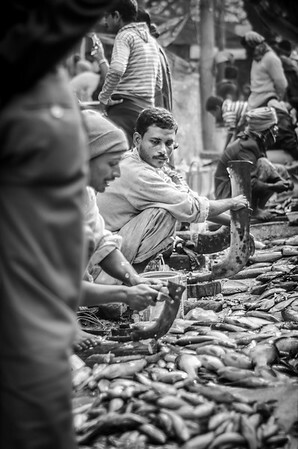 Scene from a on-street Fish Market in Kolkata, India. There are many fish sellers and everyone is wanting to sell. But some are more lucky than the others. 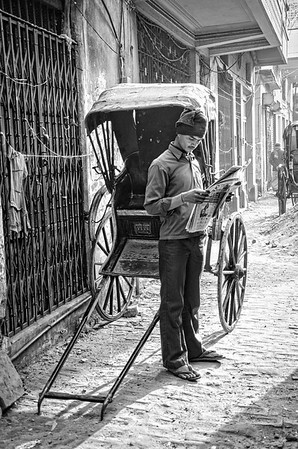 A rickshaw runner catching up on the latest news. 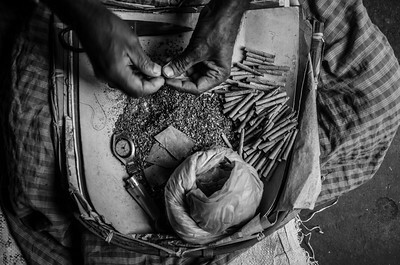 A traditional Indian cigarette being rolled by hand. It is called a "beedi". It is made of tobacco flakes rolled in a tendu leaf and then tied with a string. Early in the morning, rickshaws parked on the roadside. 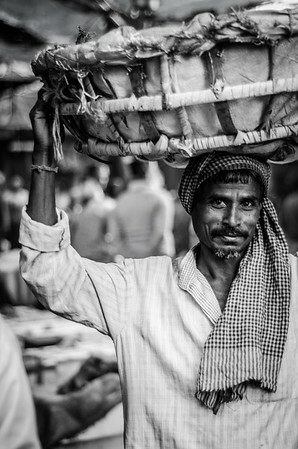 Took this street portrait in Kolkata, India. 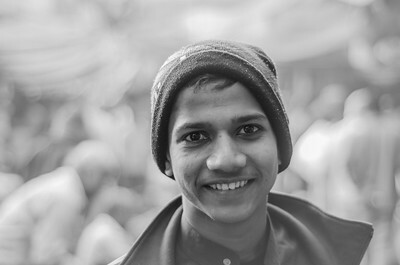 I was out on a photo walk at the Malik Bazar Flower Market next to the Howrah Bridge when this guy, after following me for sometime, asked me to take his picture. 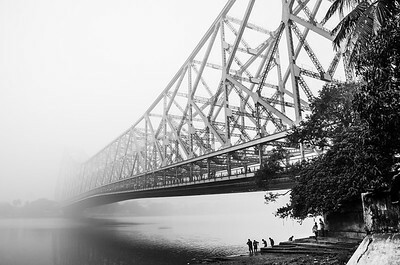 Under the iconic Howrah Bridge a number of people go through their everyday morning rituals on the ghats (banks) of the river Hoogly. 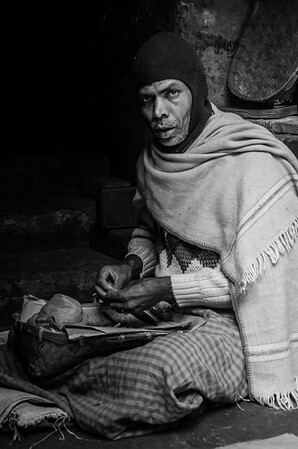 THE CIGARETTE MAKER, KOLKATA, INDIA, 2014. Beedi is the traditional Indian cigarette. This guy was busy wrapping them up. As fresh as you can get! THE "KING" FISHER, KOLKATA, INDIA, 2014. 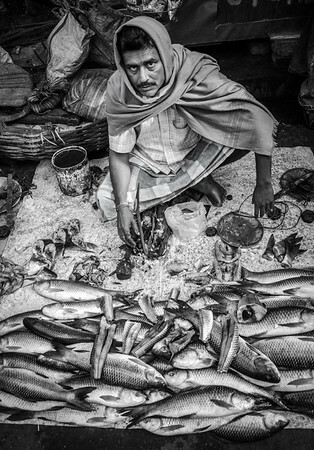 A fishmonger on the streets of Kolkata, India. There is a brutal truth in his eyes that makes this image so real for me.